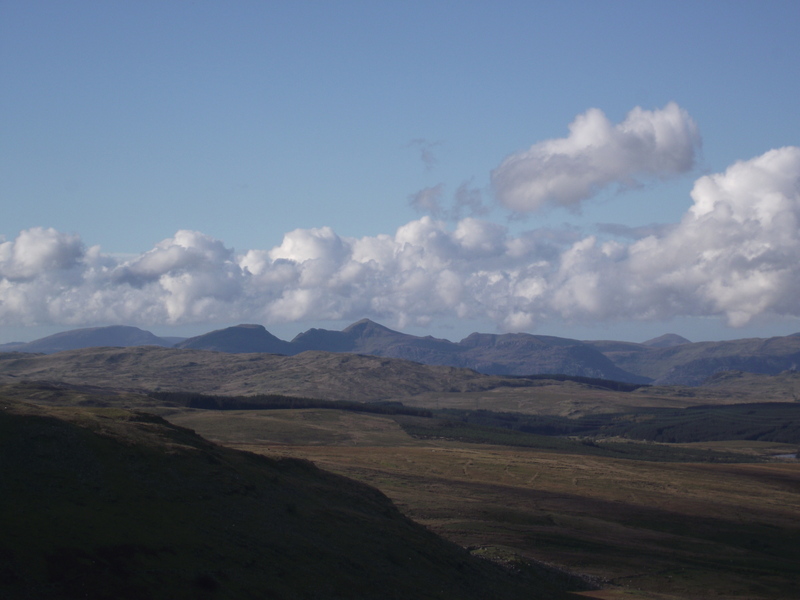 I’ve spent most of my mountaineering life not knowing a thing about the Arenig hills of North Wales. That’s probably not unusual for those who only visit the Welsh hills a couple of times a year, and are then seduced by bigger, better known and more accessible hills. 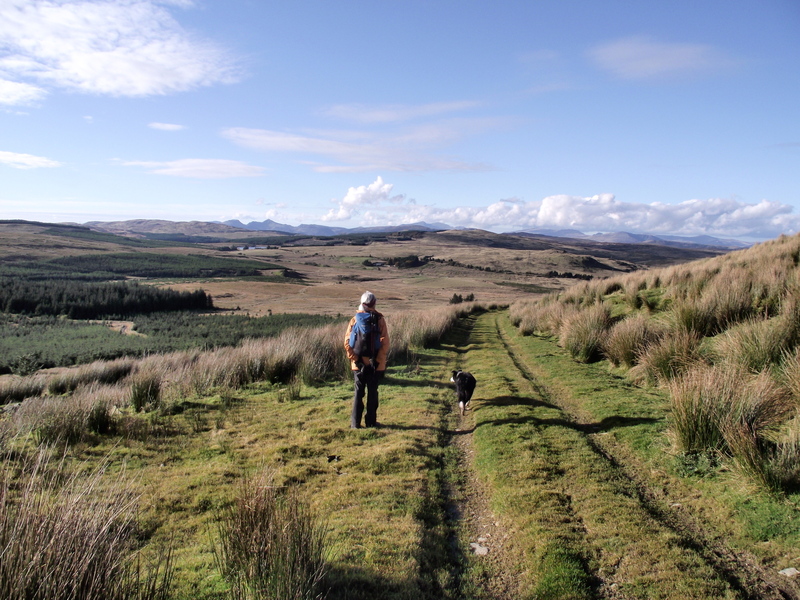 Then the Discovery Walking Guides project came along and nudged me towards these less familiar hills – we now live about forty miles from them. I’ve covered more new ground in Wales over the last couple of years whilst researching the Discovery guide than I have in the previous couple of decades. 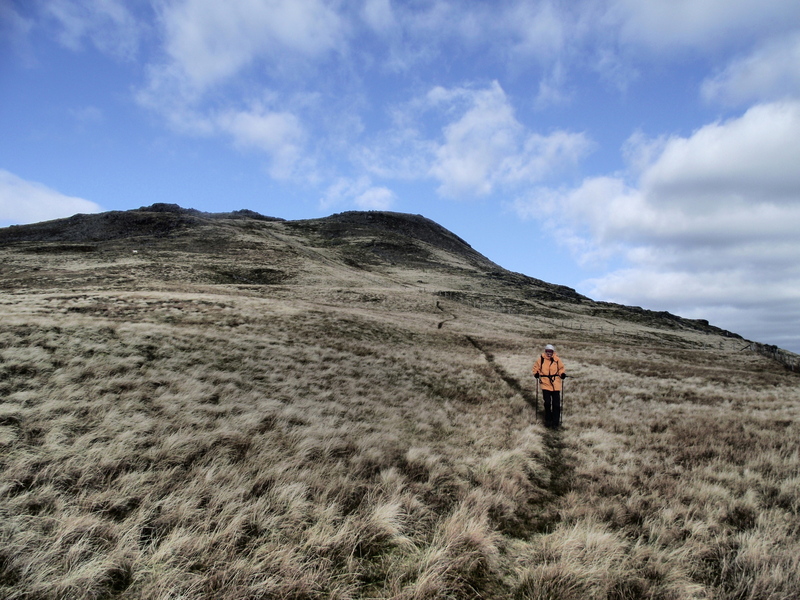 I’d had my eyes on the Arenigs for a while, but other hills had claimed priority – there have been plenty of alternatives to distract, with great hill days like Rhinog Fawr (post #95) and Rhinog Fach (post #96) competing for attention, but it was time at last for an Arenig day. The start – a muddy track! 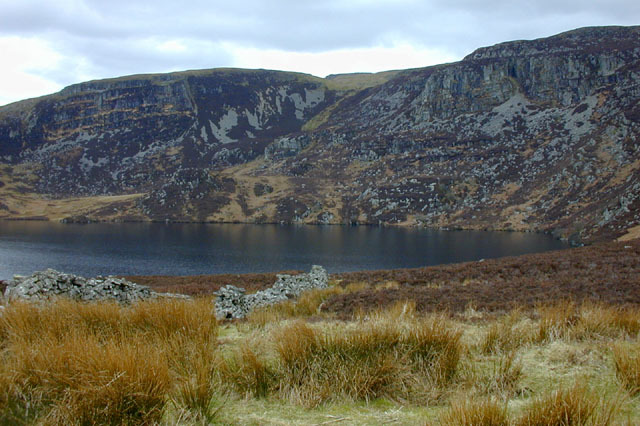 The most popular route up Arenig Fawr (“Big High Ground”) seems to be on the east side, via the lake of Llyn Arenig Fawr, but I fancied the Northwest Ridge via Craig Y Hyrddod (“Crag of the Rams”). Chris and ‘Mist’ seemed happy enough to go along with that choice, though the start along a muddy track was an inauspicious beginning. Then things literally started looking up as we turned off the track to climb the ridge. The ridge turned out to be a great choice. It was steep in places, but never excessively so, and we gained height rapidly with just the occasional stop. What’s more, the panorama behind us looking to the northwest was so stunning that we would have kept stopping anyway, if only to check out the views. 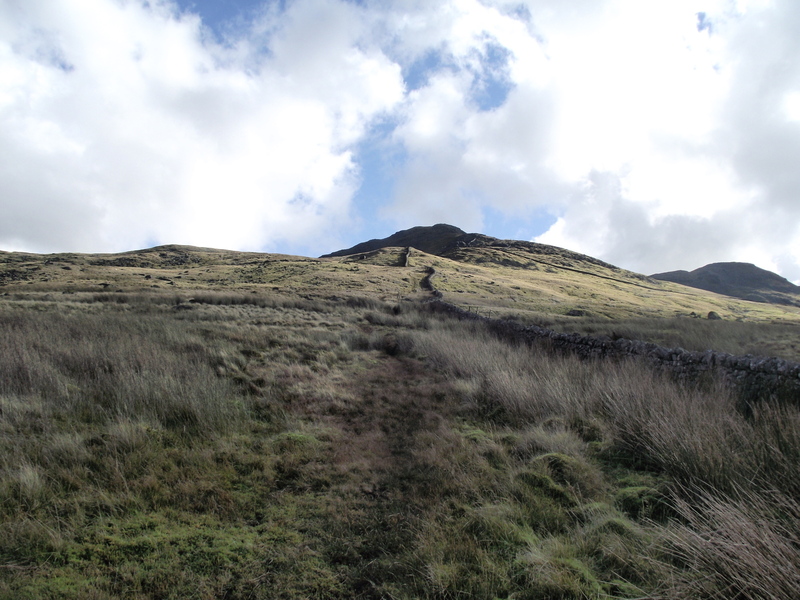 It wasn’t long before the angle eased, with a height gain of only 100 metres over the last 1 km of ascent. 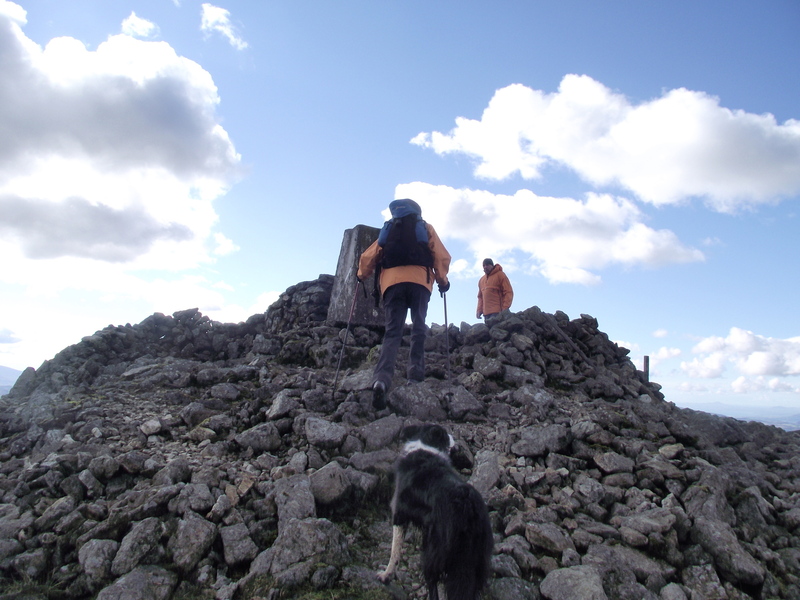 The fine weather ensured that we were not alone today, with a group vacating the summit shelter as we arrived. A cool breeze didn’t encourage long-term loitering, but I took time to look at the memorial to a flying accident in August 1943, when a B17 Flying Fortress crashed at one o’clock in the morning whilst on a navigation exercise. The eight crew members from Illinois, Kentucky, Ohio, California, New York, Michigan, Idaho and Pennsylvania were all killed. 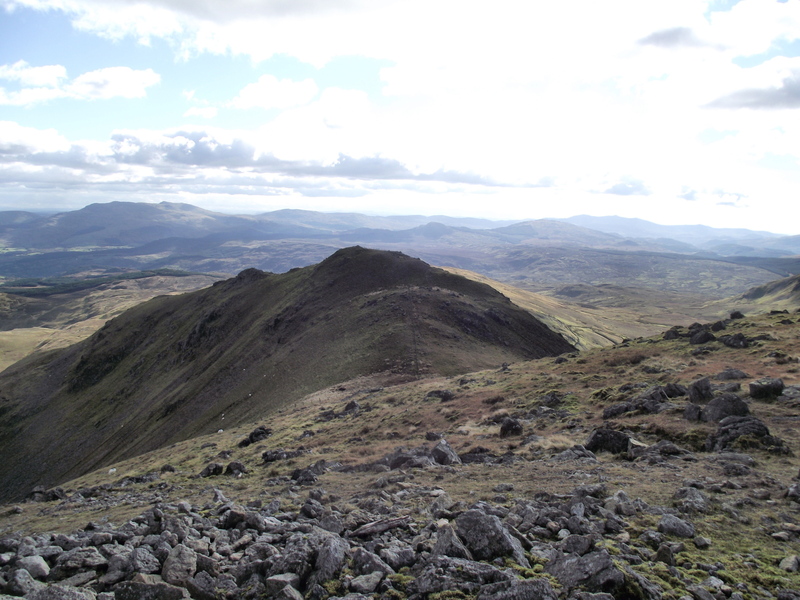 One advantage that the Arenig hills have over other hill groups is that they are a superb viewpoint, with most of the ranges of Snowdonia visible from the summit on a clear day. I joined the one remaining occupant of the summit shelter in the game of “name the summit” (I think it’s a bloke ‘thing’!) 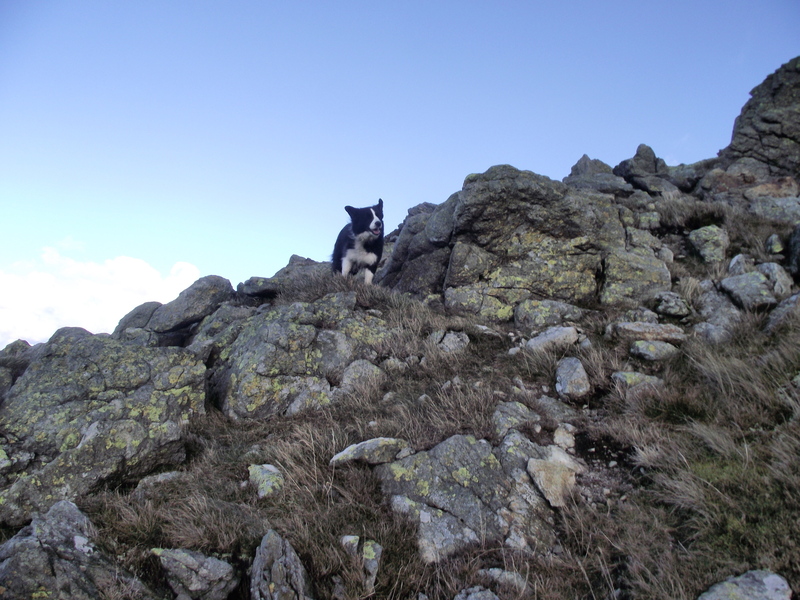 until Chris pointed out that she was starting to get cold – ‘Mist’ was also getting restless, so being outvoted I set a course for a descent down the Southeast Ridge. 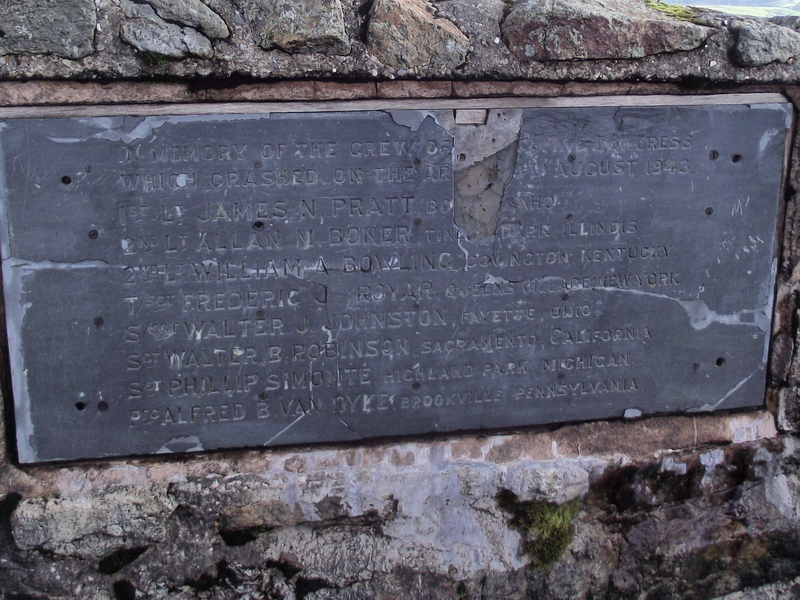 The original plan had been to head for the col on the way to Moel Llyfnant, but the map had suggested that the way could be wet, a prophecy that looked likely to be fulfilled looking at the ground on the descent. Instead, a tactical manoeuvre took us down an open hillside to a green track traversing the hillside above the boggy-looking valley bottom. Down on to the green track we had seen from above …. The green track did the business, and though wet in places it looked as though we had a better option than lower down the valley. 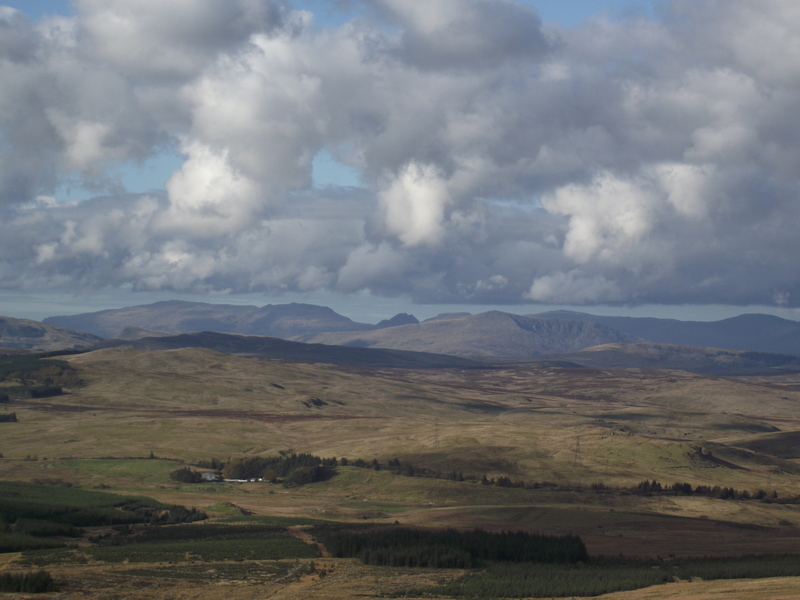 Earlier in the day I had looked across to Arenig Fach (“Little High Ground”) and the promise of continuing fine weather was already hatching a plan to come back the next day …. Text and images © Paul Shorrock except where indicated otherwise. The images by Nigel Brown and Roger Davies are taken from the Geograph project, and reproduced under a Creative Commons Licence. You will find more fine images by Nigel here and by Roger here. p.s. 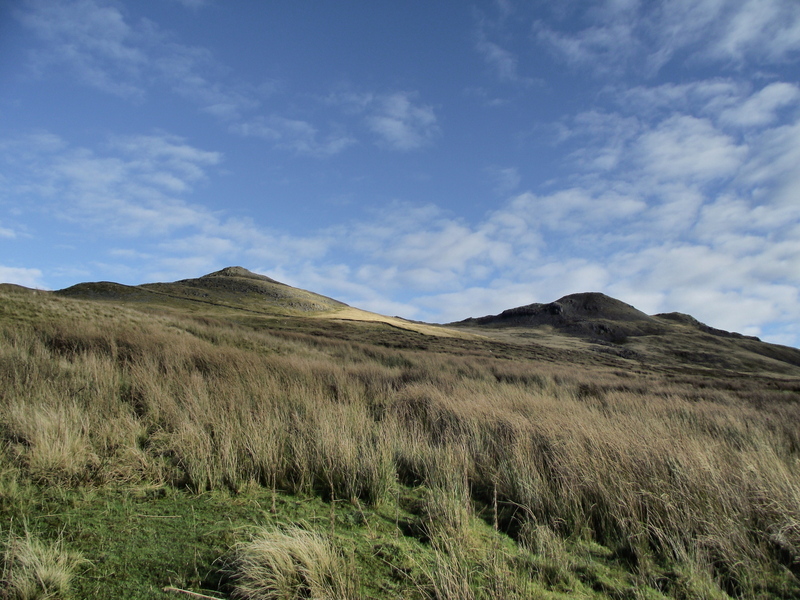 I did get back the next day and walked Arenig Fach – it was to prove to be a very different day …. Read about it here next week. Looks superb Paul…I often prefer the smaller hills than the larger ones – the larger better known hills always attract the tourists (I remember doing Scafell Pike a year or so ago and you almost had to queue to get to the summit), but the lesser known hills tend not to get the traffic. And in most cases are just as good or even better that the biggies. 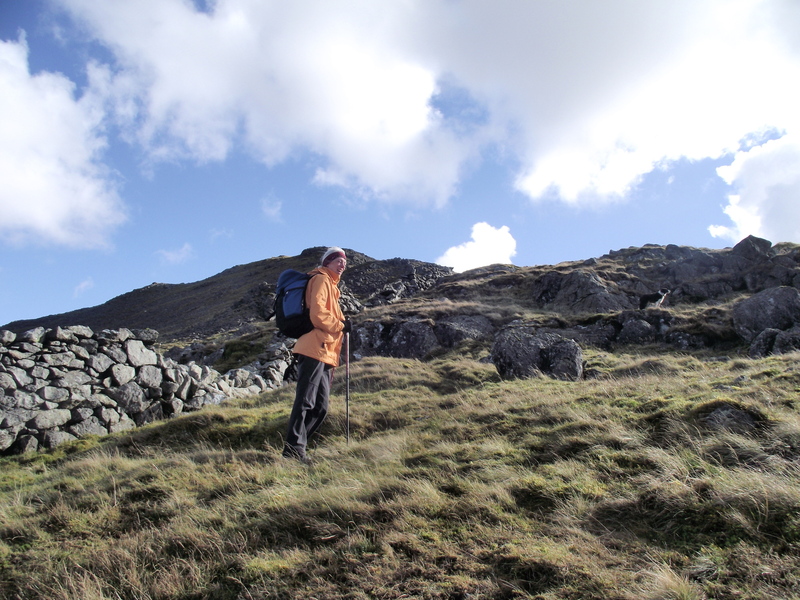 nice write up Paul, we are visiting on 11/11 a few hardy souls make their way up each year. Well done Neil, I think it’s good that people remember these tragic events. 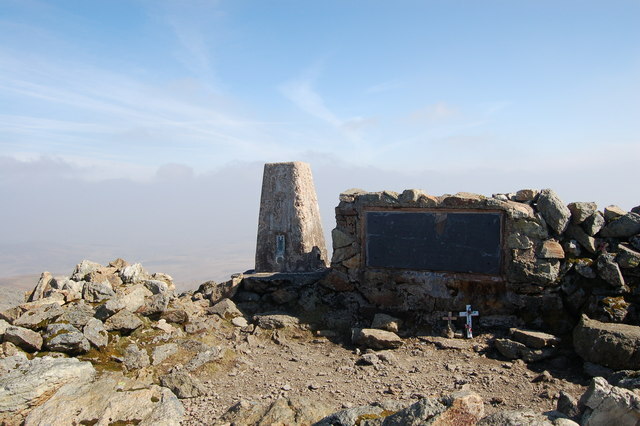 To my regret I never went to Great Gable on Remembrance Sunday, despite living in Cumbria for 25 years. Looks like you had a great day, though I think Chris was glad of that warm jacket? To mind, these ‘lesser’ hills are often ‘big’ in their own special way. The Arenigs don’t have the altitude (though 854m isn’t exactly a molehill!) 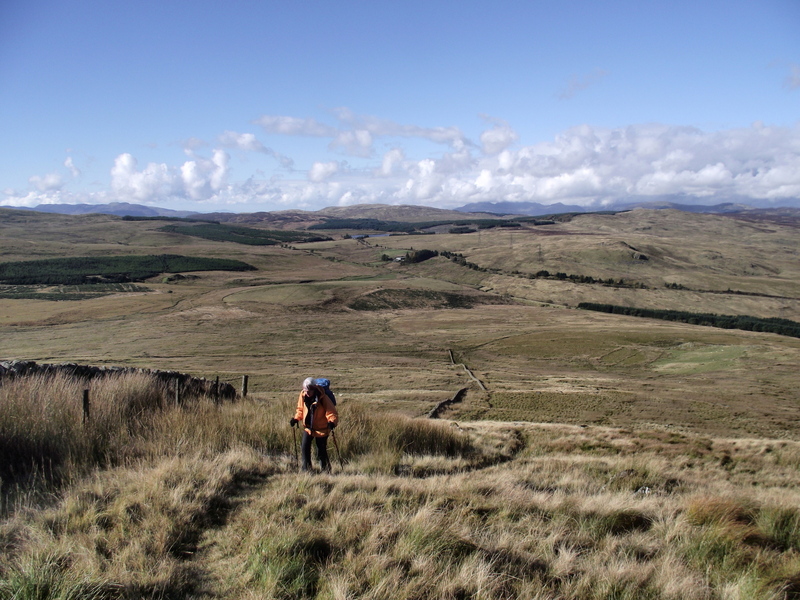 but they have a feeling of space, a bit like the Highlands – if that had been the Lakes you would have found a load of summits nestled together (OK, I generalise a bit) but the Arenig peaks were surrounded by miles of moor. 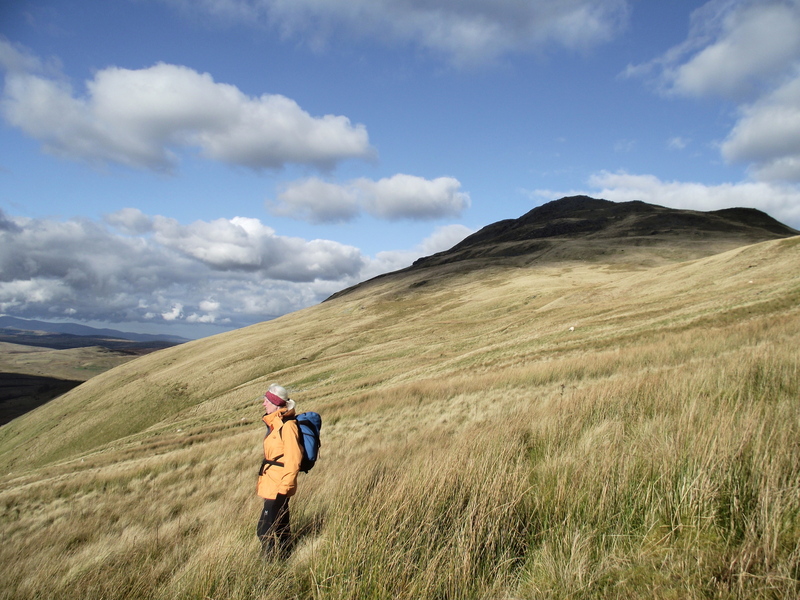 Haven’t done Arenig Fach yet (which I believe is totally pathless heather?) – must rectify that sometime. 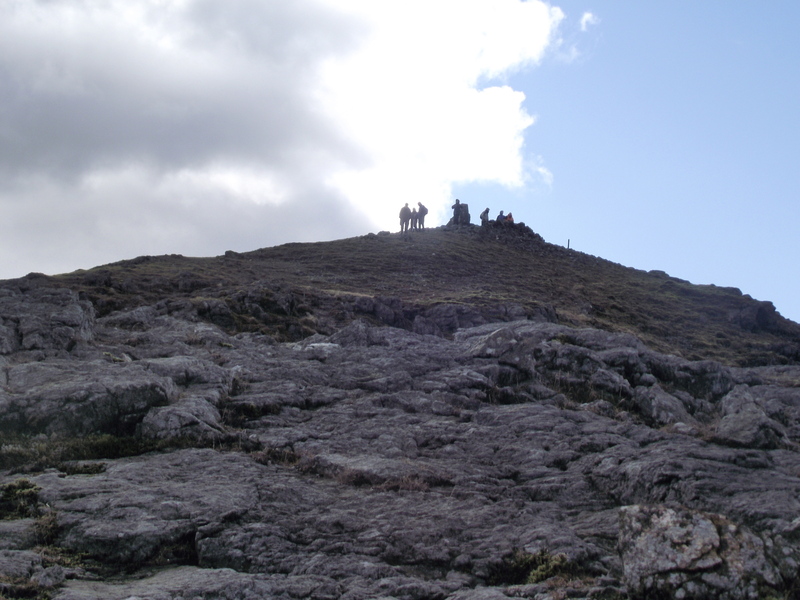 I think we did the same ascent as you (in winter – me and my 2 mad friends from Manchester). 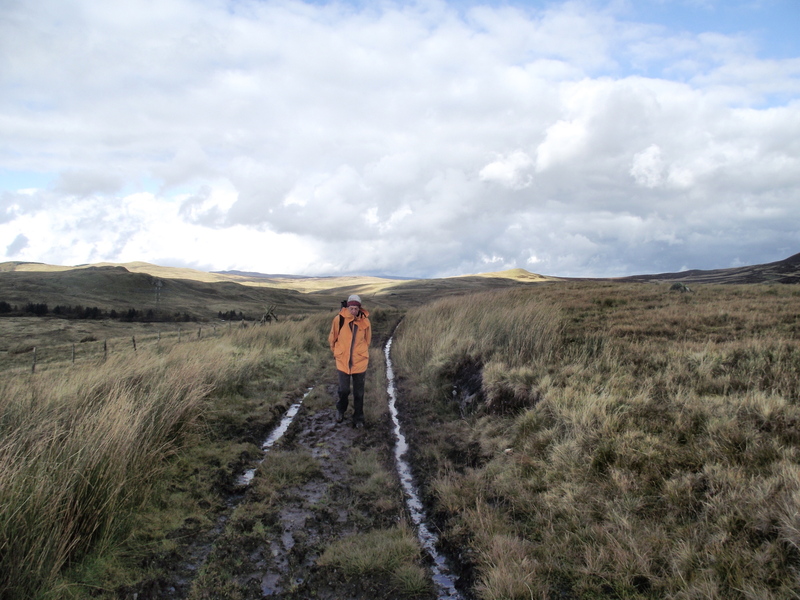 I remember the path was still boggy despite the ice, and the little road to the peaks was lethal but didn’t stop my friend Mark from whizzing along it and skidding about! 😮 ). We then came down the back to the Llyn and I seem to remember a little bothy somewhere there? 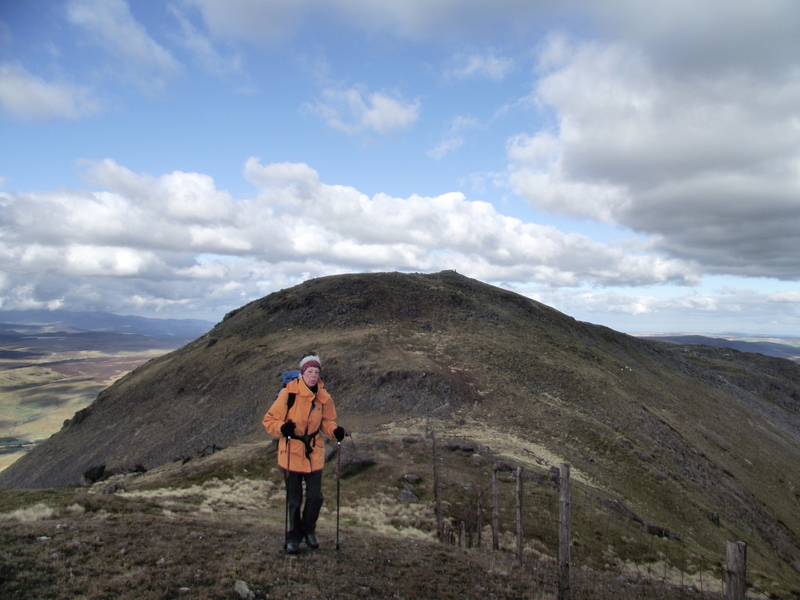 Oh, and spotting the summits all around is definitely not a man-thing – I do that and point them out to Richard who’s generally freezing and in favour of leaving for the descent instead! Never been on these mountains but the outliers are always worth it for the views of the main mountains that you can see given good weather – and certainly on this occasion you had a great day for it. Love the crisp photography and the write up. Amazing how you get such a clear shot of Tryfan in the gap. Instantly recognisable. Thanks for that Andy – I commented recently that I regard myself as a writer who takes photographs rather than a photographer, but the light was quite good on this trip which does help. 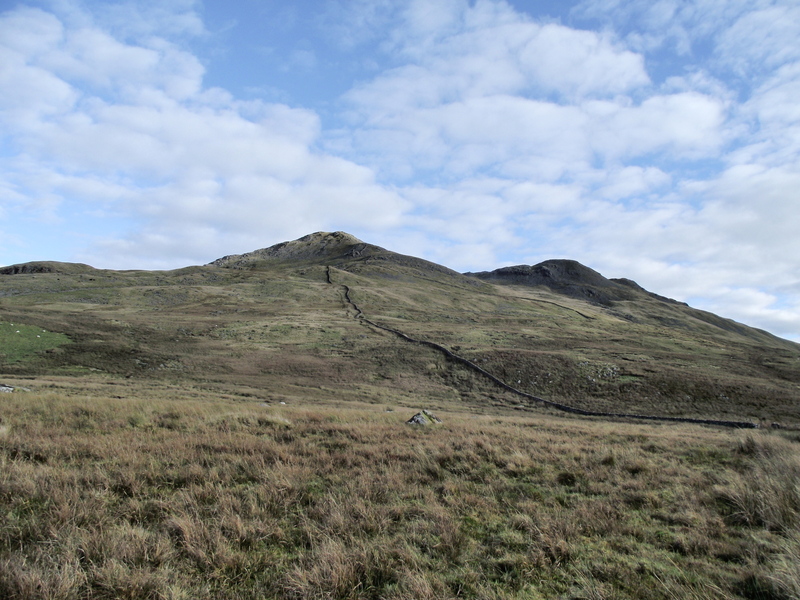 Next week’s post (Arenig Fach) will probably include another Tryfan image with more detail of the East Face – you can almost pick out Adam and Eve! A fence post made a reasonable improvised tripod for that shot! Hi Paul, always good to get a trip report about hills I know nothing about. Your trips will be a good source of information for when I am in the area and looking for something new. Nice post Paul – I like this area. 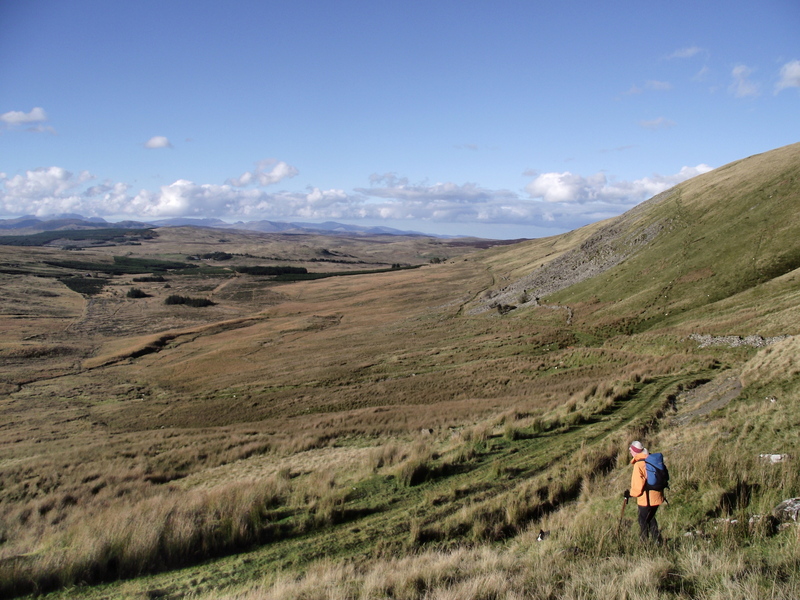 Makes a change from central Snowdonia and you can walk for miles and see no-one. 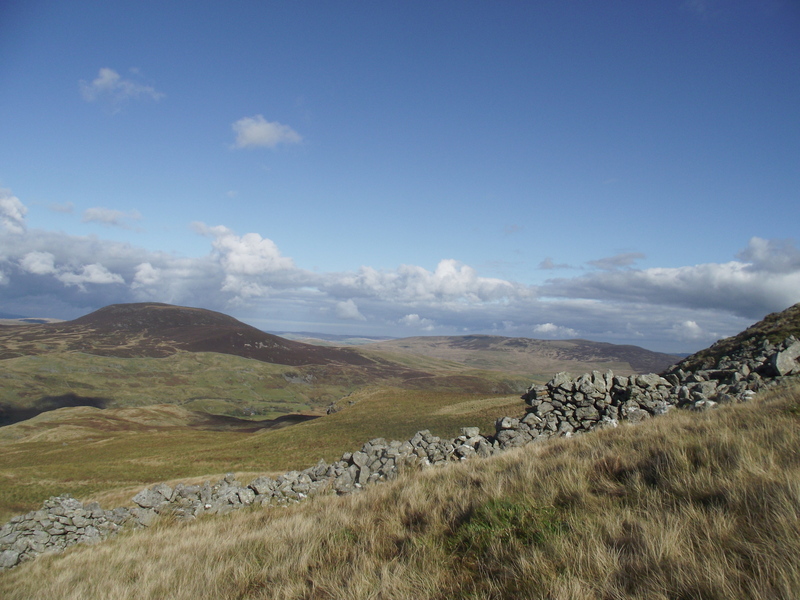 The Aran Ridge and the Berwyns are similar. Can you tell me how to reach this place from London? Hi Anindya, thanks for visiting and for the comment. 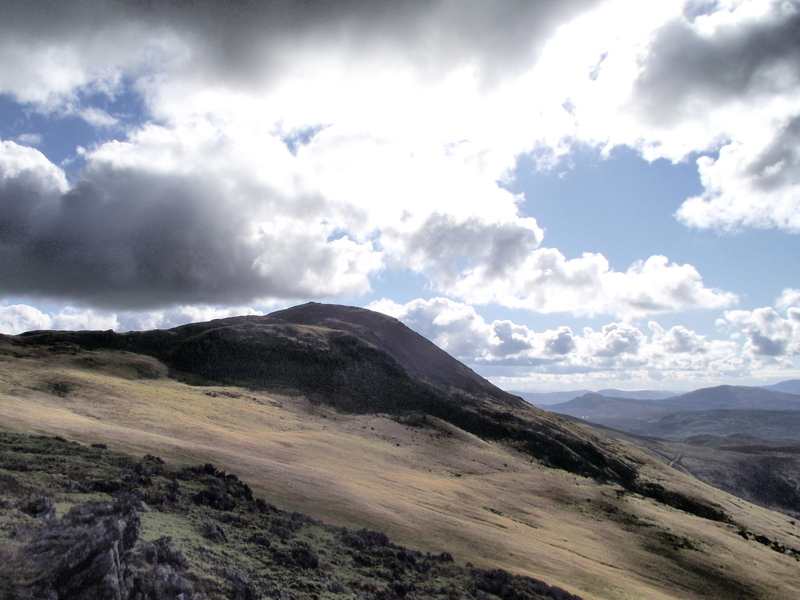 Arenig Fawr is a mountain in Wales, and is about 350 kms northwest of London. 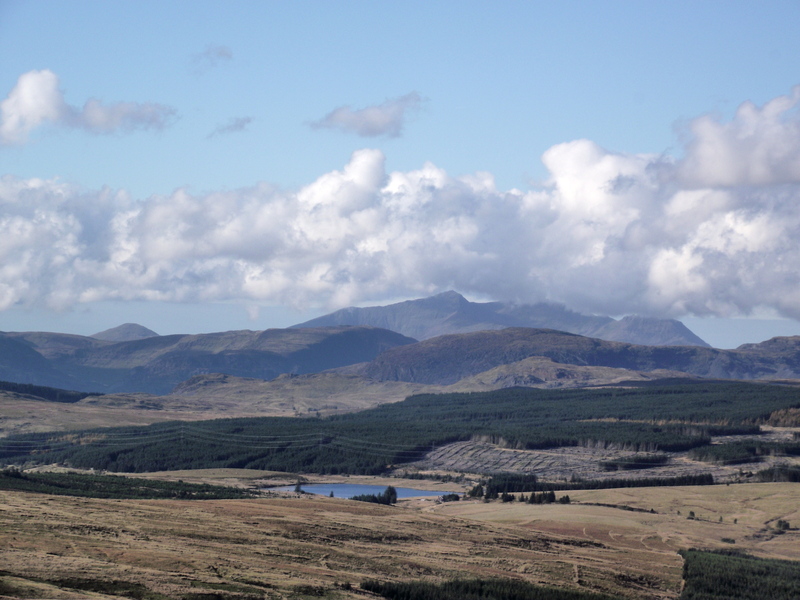 Travelling from London, most people would go by the M1, M6, M54 and A5, then head for the small town of Bala – Arenig Fawr is near there.